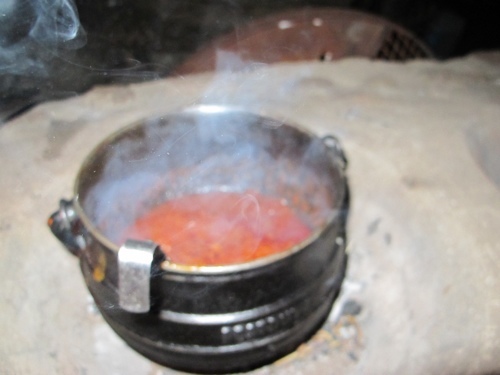 Was it an authentic boma dinner? Who’s to tell? I love it. 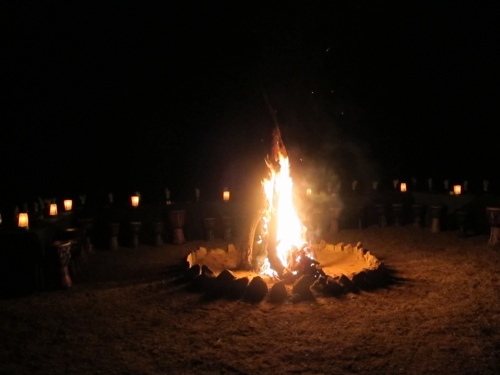 Bush dinner under open starlit skies only African nights can offer. Listening to the rhythm of African drums as the aroma from various meats grilling to perfection wafted through the thin dusty air. Curries stewing in open metal pots. Camp fires and blankets failing to keep us warm. Campfires at 6 Celsius? Hand me that blanket! Steaming hot. Just the way we want it. 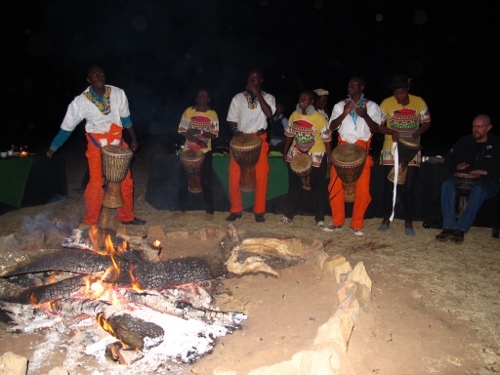 The drum beats and a motley group of singers and dancers entertained us in the Entabeni Private Game Reserve. 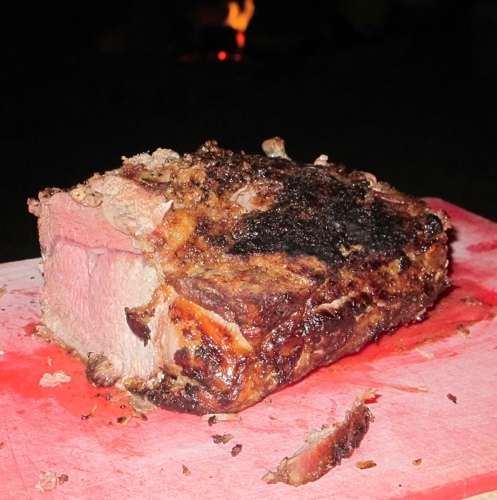 So, this is what dining in the bush is all about. Another “experience” tucked under our belt. Hard to appreciate then because of the cold. Too cold that the thought that a beast may lurk somewhere in the dark hardly mattered. Too dark that we hardly cared what exotic meat we may be eating. But it must be said. They sure know how to do their steaks here in Africa. 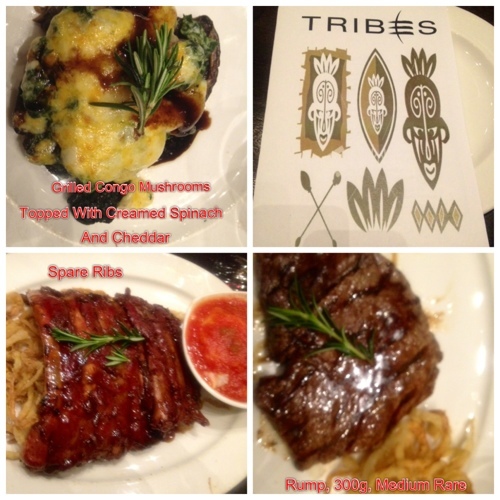 In Tribes in the Emperor Palace Complex in Jo’burg where we dined, I enjoyed my 300 gram rump so much. Before that, the Congo Wild Mushroom topped with creamed spinach and cheese is “to die for”. Better than Portabello, if you ask me. Order the Congo Mushrooms and the Rump. You won’t regret it. Then some Malva Pudding as African dessert. 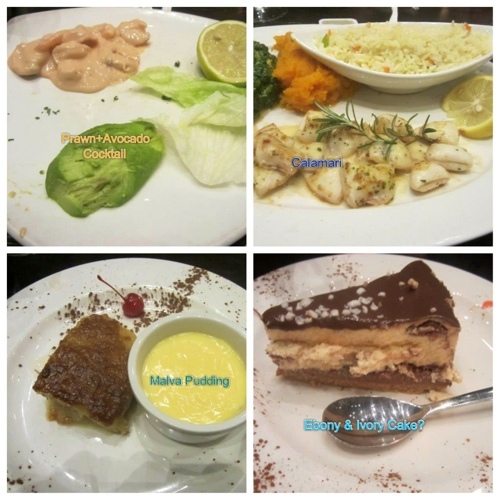 Malva Pudding on your lower left, folks. For the life of me, I never thought I’d fall for antelope meat that much. The Zambezi fish was so good yet I just couldn’t pass up the exotic meats. Guess I knew they’re to be “experienced” best here than anywhere else. 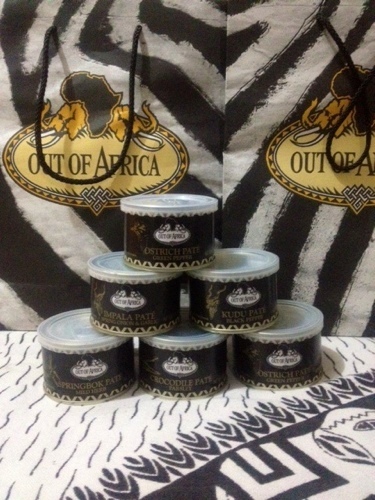 Truly, the “taste of Africa”. Speaking of which, I didn’t fail to visit the store by the same name to take home some pâtés made from the same exotic meats: crocodile, impala, kudu, ostrich, springbok. 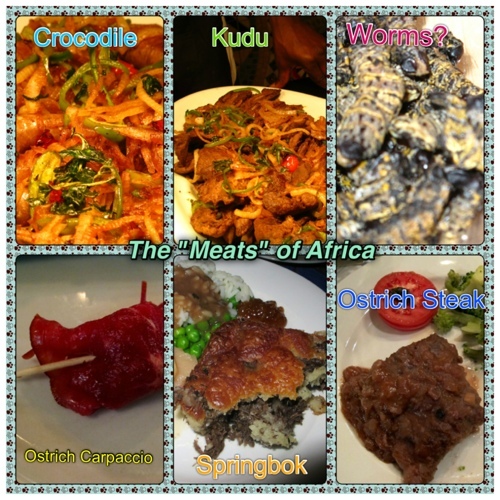 Exotic meat pates: Crocs, Kudu, Ostrich, Impala, Springbok. For sure, this is an African cultural and culinary experience. Chatting up locals, engaging in culinary adventure, drinking their local beers and wines, bush dining under African skies. Quite a sensory experience, don’t you think? The cheesy Congo mushroom happens to be my favorite, along with the springbok boboties! An African Safari is a must-experience. Right now, I’m dreaming of the Masai Mara!